Well, I got to update this again last week. 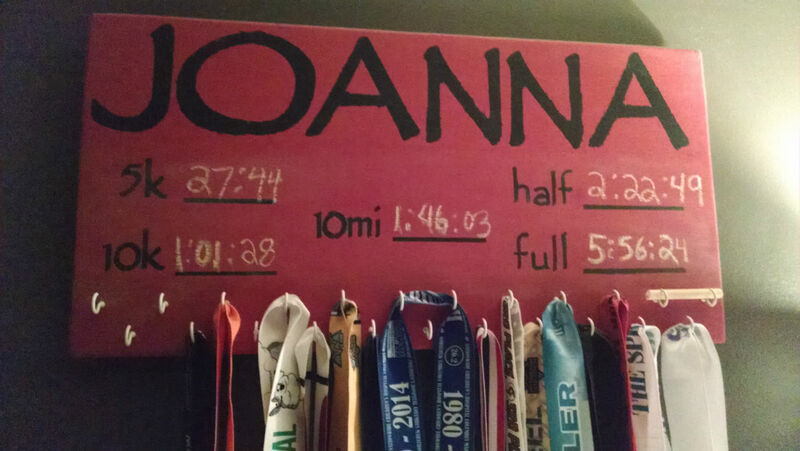 After the Carnegie 5K, I got to update my PR board to show my new best time: 27:44. That’s an 8:57 average, which is the fastest I’ve ever run 3 miles in my life. Actually, the first time I ran one mile under 9 minutes was during the Runners World RunStreak from Thanksgiving to New Year’s. It’s always cold for this 5K, but it’s one of those great community 5Ks that people really get into and it benefits the local volunteer fire department. The Carnegie 5K is one of my favorite annual races, particularly because it was my first 5K back in 2012. That race, I ran a 36:10 and thought I had climbed Mount Everest when I was done. I’ve come a long way in three years, that’s for sure. I didn’t really have a strategy for this race except for to run at my maximum effort for the whole thing without pushing over the edge. I didn’t run with music or headphones, not wanting Map My Run to give me updates when I was trying to run on effort and not needing to stick to a pacing strategy. And so I just went, as hard and as fast as I could, knowing there’s a little incline at the end and a trick where you think you’re coming in to the finish line but you really have to go run around the municipal building again. After the race, my friend T noted that the incline seems progressively less of a beast each year that we do this race, where it didn’t even feel like a blip this year. Maybe it’s because of all the hill training I’ve done this season or just the sheer number of miles on my legs right now. But I got it done, coming within sight distance of the clock and knowing it was definitely going to be a PR. I gave it the rest of the gas in the tank and broke 28 minutes. 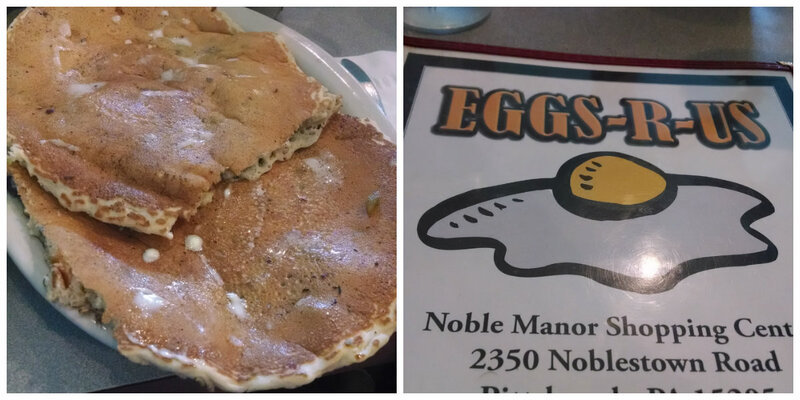 And then there were pancakes. What I’m going to start calling #PRcakes. I went home that day with a great feeling. It’s the feeling that I have been chasing since Thanksgiving last year – the feeling of training that has paid off, of stronger, faster legs, and pride that I did my best. That feeling carries me into the Pittsburgh 5K and Half Marathon this weekend. I’ll be running the 5K mostly to collect the Steel Challenge medal, so that’s not a PR attempt but a casual warmup run. But I’m ready and excited for this race, almost as much as I was excited for the relay the first year that I did a Pittsburgh Marathon event in 2013. 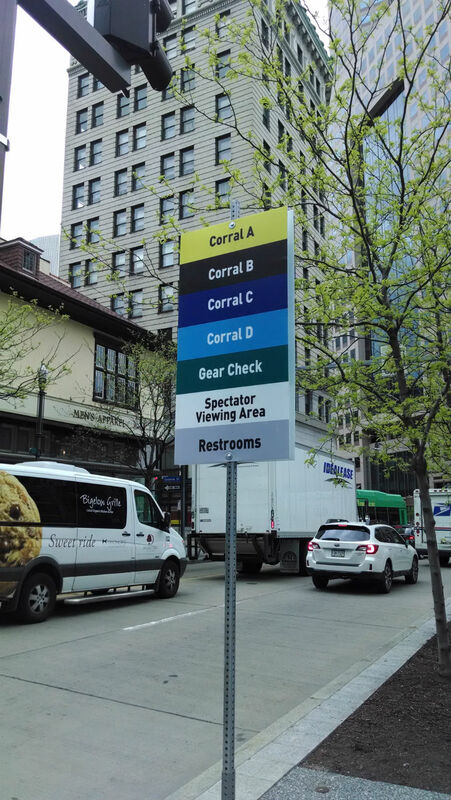 I saw these go up downtown yesterday and I did a silent squeeee because it means the day I’ve been training for since December is finally here. I’m heading to the expo after work today and I plan on savoring it. I also plan on stopping by the Greater Pittsburgh Community Food Bank booth to pick up my “I Run to Fight Hunger” shirt. Thanks to your donations, I raised over $800 this year – a more than $100 fundraising PR! I am beyond grateful for every dollar donated. There are kids in our area who will have nights with full bellies because of your support. So thanks. There’s still time to donate up until Sunday, so if you have something to give, use the module to the right or visit crowdrise.com/joannastone and click on this year’s race. Follow me on Twitter or Instagram (@nextgenhouse) for race updates this weekend. And sign up to track me during the race here! I am a goal-oriented person. I think I’ve always functioned that way. I have to have my eyes on something ahead, or else I get lost. It’s part of the reason why it’s impossible for me to be bored. There’s always another goal to reach, a height I can climb to. I am proud of the goals I reached in 2014. And even the ones I attempted but didn’t quite reach. But it’s also been a difficult year for me. My company has had a chaotic year, and it looks to continue like this for the foreseeable future. When you work 45 hours a week at a job that is stressful, and spend about 6 hours on top of that commuting every week (if I’m lucky), you’re already starting “behind” so to speak. Don’t get me wrong – I don’t claim to be the busiest person in the world (and that’s not a badge that I’m interested in earning) and I also know that we’re all given the same 24 hours a day and it’s how we spend them that counts. But I know for me that 2015 has to be different. I’ve had a GI issue that I’ve been struggling with for more than a year and the only things the doctors can tell me to do are things I already do, plus “manage your stress.” So that is telling me something. I manage a thyroid disease that doesn’t guarantee me the greatest sleep. Here’s the truth. I feel like a really old cell phone battery. You know what I’m talking about here. When a phone is just about toast – when it can only stay off the charger for about an hour before you get a low battery warning. I am that “nearly toast” phone. Thus, I’m structuring my goals a little differently this year. I still want to have some specific goals, but I have an overarching theme this year that all of my goals need to be aligned with. What’s that theme? I need to create more margin in my life. I have to be okay with the fact that I can’t take on a lot of new projects or hobbies right now. I would love to have time in my life to make my own yogurt and bake all my bread from scratch. I’d like to take a foreign language class or develop my photography skills. But that list gets quickly out of control, especially when you have homesteading type aspirations like me. It just becomes too much. And I don’t even use Pinterest. So most of my goals this year are extensions of things I currently do – or truly need to do to be my healthiest self. I’m setting my sights on being the healthiest, happiest Joanna I can be within the things I can control. We don’t actually have a separate room in our house for sewing, but we’ve re-purposed the guest bedroom to be a space for my sewing machine and for my favorite reading chair. It’s pretty smushed, but I have plans for it – both for organization and decorating. Margin: This room is a calming place for me to go to focus on quiet hobbies. Making it a comfortable space encourages me to spend time in it, doing things that are relaxing. I have saved all of my race bibs, and I have a photo from every race that I’ve done. I want to create a simple album for both the bib and the photo, with a few stats on the race. Nothing complicated, but just archival. Margin: The overflowing box of these items needs to be organized for it to be decluttered. This year is the year. 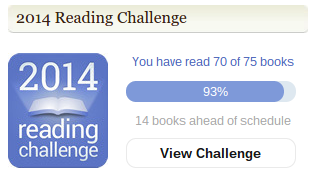 This year I read 100 – finished my last one on New Year’s Eve. My goal for 2014 was 75, so there’s a part of me that wants to reach for 125. But I know that 100 felt pretty comfortable as far as pace for me, and I want to keep that same comfort level and not push. I might vary the genres a bit and expand my horizons, but I never have a shortage of things to read, so I’m keeping it simple. Margin: Reading is my favorite re-charge activity. I don’t feel like myself when I’m not reading, and it satiates my cravings for more knowledge, which have just been part of my personality since I was a child. That will never go away, so incorporating intentional reading in my life makes me feel like myself. Which is essential for stress relief. 2014 was the year of the marathon, but I’m going back to the beginning in 2015. The half marathon is my favorite race distance, and I want to get my fitness levels back to where they were when my GI issue wasn’t so serious. I recently started my serious training for the Pittsburgh Half (more about that next week!) and I hope to PR at that race and spend a lot of 2015 doing maintenance, casual running. Margin: Exercise is an essential part of maintaining my overall health and about 85% of the time, it’s also a stress reliever for me. Having concrete running goals helps me maintain that habit. Now that I made my own, it’s time to do one for Mark, the king of t-shirts. Margin: Sewing has become a calming activity for me, and picking only one “project” for the year is a manageable goal for me. I will likely sew more than that, but I’m not over-committing. The last time I had a really bad thyroid flare-up, I got in the habit of a calming sleep routine – chamomile tea before bed, deep breathing and meditation, etc. Once I started to feel better, that slowly fell by the wayside. I’m going to try to do at least one relaxation technique – tea, deep breathing, guided meditation, yoga, etc. every day. Margin: These kind of behaviors activate the body’s relaxation response, which is key to stress management. I need to commit to this probably above most other things. I am going to begin with a series of daily yoga videos and will change it up as necessary. We typically eat really clean diets, full of lots of whole foods and vegetables. But since about November, I’ve been relying more on convenience food and also slacking when it comes to my vigilance with eating only ethically and sustainably raised meats. Time to recommit. Margin: Clean eating is as essential as exercise for me, both for my particular medical issues and just for general health. I’m passionate about it and need to remember that passion when I’m tempted to make choices that aren’t the best for me. This site is a hobby. I love writing and sharing here, but I will also not take on projects that I can’t manage simply to have something to write about. I am going to try to allow the site to naturally come together based on what we’re actually able to do, being two people with full time corporate jobs in an urban setting. Margin: Because this blog isn’t an income source, I can’t prioritize it like it is one. I will do my best, and that will be good enough. What are your goals for 2015? Anything that you want to do differently? Or am I the only one that spends time thinking about this stuff? November was a crazy month at our house. A lot going on in general, and then we received the unexpected news that Mark’s Aunt Barbara had passed away. Aunt Barbara was one of Mark’s closest relatives, and a constant presence of love and support in his childhood and adolescence. She lived alone, and we’ve tried to make an effort to go to Cleveland see her every two months or so. Every time we visited, she sent us home with something from the house (and a bag of chocolates from Malley’s). She was trying to slowly downsize her possessions, and one year she wanted to give us her Christmas tree and asked if we’d put it up. She had downsized to a smaller fiberoptic tree and her beloved Nativity set, but she really loved Christmas and wanted the tree that her family had for years to go somewhere to be enjoyed. And we agreed. Sunday night, Mark was out of town. So I put up Aunt Barbara’s tree. The house was quiet and the lights were low (conveniently, our dining room overhead light is broken). I sorted all of the branches and attached them. 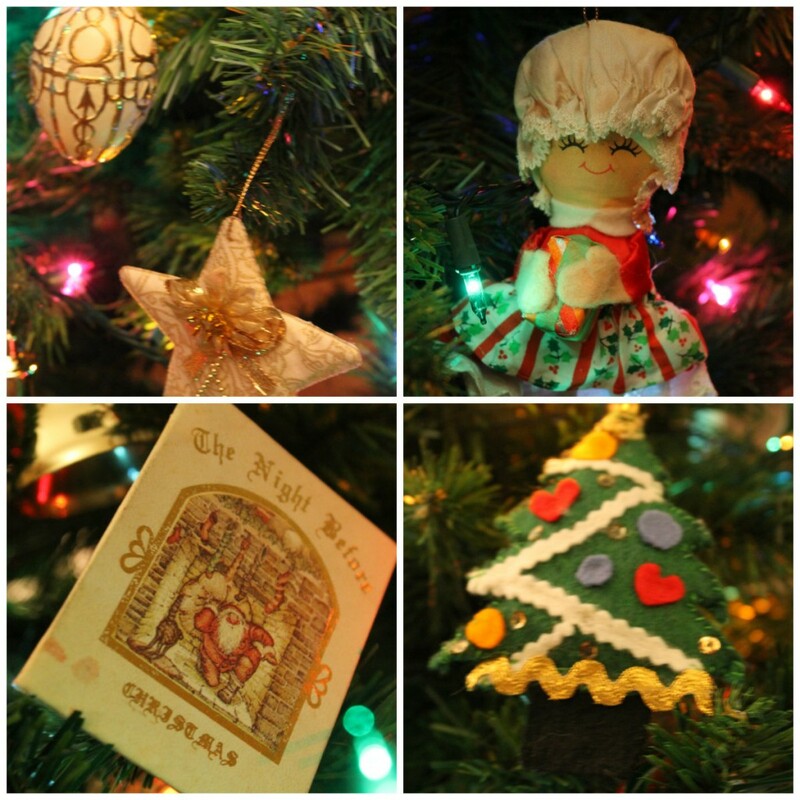 Aunt Barbara was nothing if not meticulous, so each branch still had its original labels and the tree remains in perfect condition. 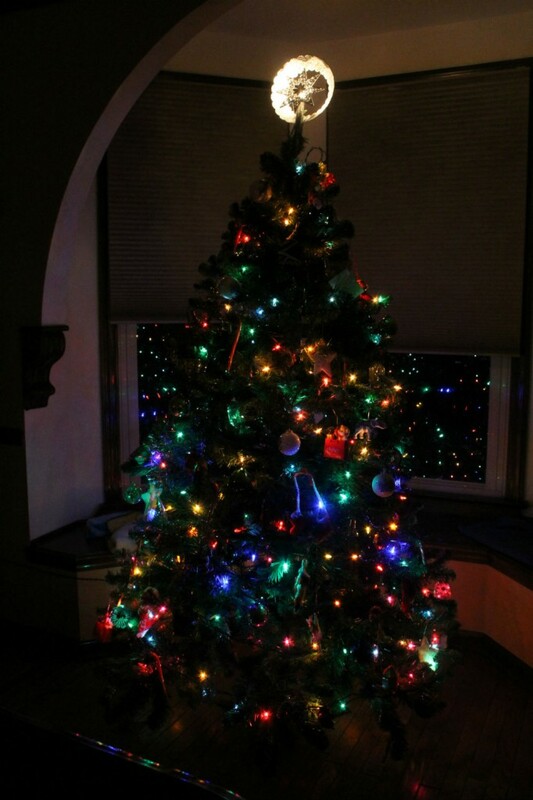 I added some lights – a combination of her lights and some that we had. Cheap tree lights don’t stand the test of time very well – though the first year we unboxed her lights, we found strands carefully wrapped up in tissue paper marked “broken.” Which is so Aunt Barbara, it’s not even funny. With the lights on, I pulled out the ornaments. Just the plastic ones this year, since we don’t know how Stormy and Vader are going to do with a Christmas tree, and I have a sneaking suspicion that this tree is going to be on its side at least once during the season. There are some great vintage glass ornaments, but I didn’t want to take the chance. 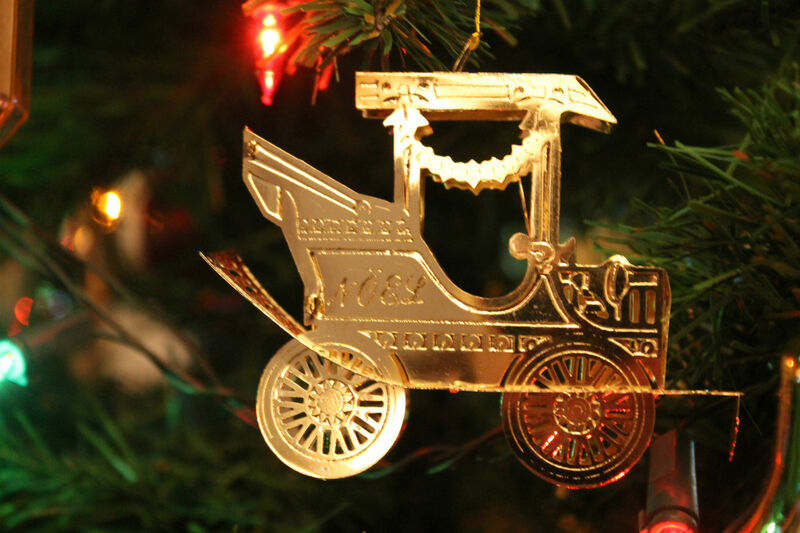 Aunt Barbara’s ornaments date back many years, in particular to times when people didn’t buy a lot of individual ornaments like we do now. No Disney characters or sports teams or hobbies. Classic Christmas ornaments, 12 identical ones in a box. Probably purchased from the Five & Dime. 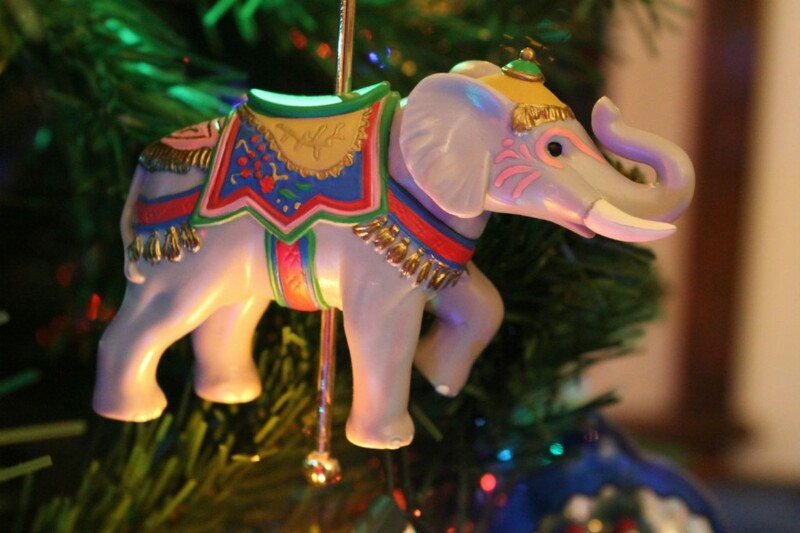 Aunt Barbara’s mom, Mark’s grandmother, Eleanor, loved elephants. So there are some of those. There’s something beautifully simple about her ornaments. 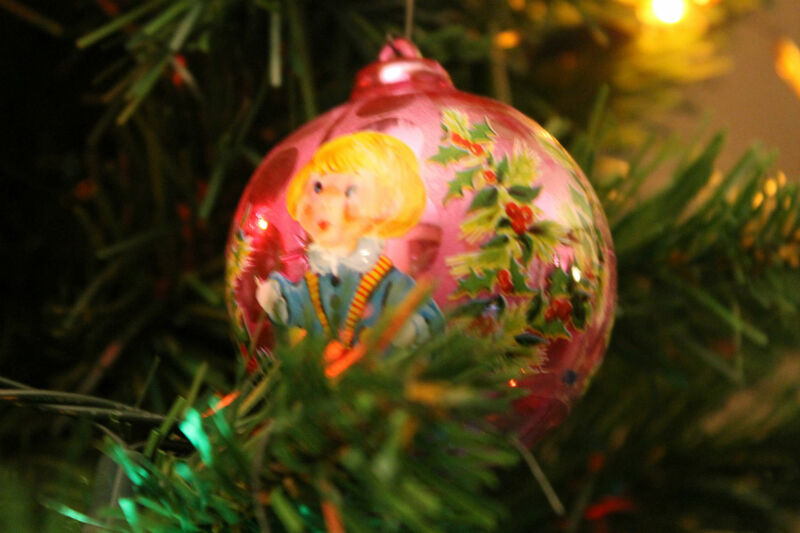 Nothing in particular distracting – all of them adding a bit of color and sparkle to the tree. Her tree isn’t Pinterest-worthy and isn’t themed or color coordinated. Some people would probably call her ornaments vintage. Because they are older than me and none of them light up or sing or play movie scenes. I got to thinking about how much this tree is a reflection of who Aunt Barbara was. Simple and utilitarian, but not lacking in happiness or brightness or celebration. I’ve never met anyone who took such joy in such simple things. In a season when we all fall prey to the lure of sales and discounts and gifts upon gifts, Aunt Barbara was more happy with a box of my homemade vanilla macaroons than she ever would have been with a gift we bought at Target. I met Aunt Barbara for the first time about five and a half years ago. I was charmed by her immediately, her sense of humor and the fact that she was both smart as a whip and stubborn as a mule made us get along well. I like to think we had a special connection – especially because she left Cleveland to come to our wedding in 2010 – an event described by other family members as a coup of epic proportions. (On the two conditions that she return to Cleveland that evening and also not be forced to eat fish at the wedding reception. We complied.) She wasn’t effusive, but I know she loved me as her niece and not just someone her nephew married. This season will be hard and there will be no Christmas trip to Cleveland, with her worries about us driving in the snow. She loved Christmas, and we loved visiting her at Christmas especially. Aunt Barbara’s life was a reflection of her priorities – her faith being chief among them. If she had all of her needs met and could worship every day, she was truly happy. She exalted in the Christmas season in the best way – by not going after more and more, but by putting up her Nativity to remind her of why we celebrate in the first place. Even when this full-size tree stood in her house, it wasn’t about which fancy LED lights she could get on clearance at an after-Christmas sale or which Hallmark collection ornaments she had. She had the same ornaments year after year, and that’s part of the beauty of this tree. 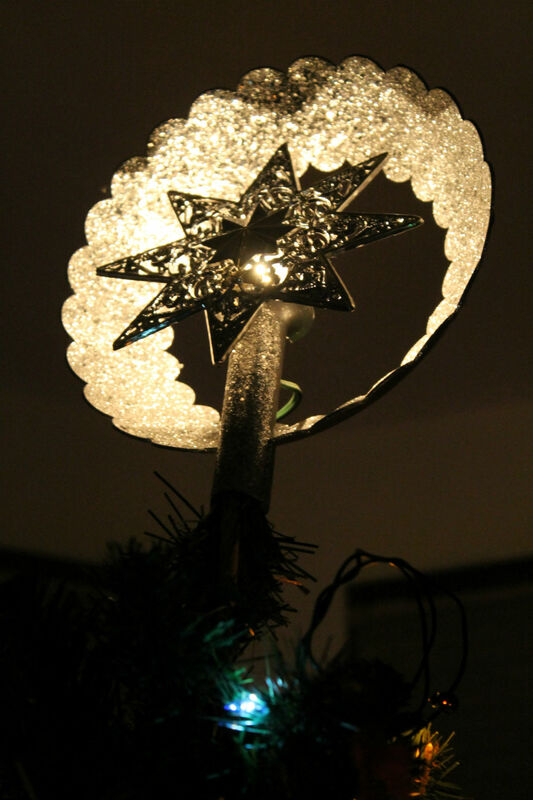 Finally, I secured the sparkly, light up star at the top of the tree. I like that it’s a star and that it shines so brightly, because it makes me think of her – now in a better place. I hope that I let her example lead me this holiday season. And when I make a batch of vanilla macaroons – now officially named Aunt Barbara’s Favorite Macaroons from now until eternity – I will feel her joyful spirit. I grew up in an area of western Pennsylvania where hunting was pervasive and an accepted way of life – and of putting food on the table. The first day of rifle season for deer is practically a state holiday. But I have found after living in a city environment for almost 10 years, hunting is still prevalent, but it’s not discussed as much – and thus, not as understood. Mark hunts, and for the last two seasons we’ve had venison in our freezer. People often ask me why he hunts (and give me their very strong opinions on the practice), so I thought it would be interesting to ask him a few questions about hunting and what it is to him. This is fair warning that he talks about killing and eating animals (because that’s what hunting is), so if you have strong predilections against eating animals, this isn’t the post for you. We respect people’s rights to eat what they want, but we don’t refrain from eating meat in our house that is in our opinion ethically raised or hunted in the wild. The following are the questions I asked Mark and his answers, edited only for length. When did you start hunting?I started hunting when I was 18 and living in Ohio. I didn’t grow up in outdoorsy family and was actually the first person in my immediate family to own a gun. When I turned 18, I bought my first gun, a Remington 870 Magnum 12ga, and would go squirrel and rabbit hunting with my best friend’s dad. I always wanted to get into big game (deer, turkey, bear, etc) when I lived in OH but didn’t know where or how to get started. So, I didn’t start big game hunting until I was 33 and living in PA.
Why did you start hunting? I’ve always been fascinated with the outdoors, survival, hunting and self sufficiency. One of my favorite books as a child was My Side of the Mountain and, to this day, I would love to live a life of self sufficiency off-grid. My parents never nurtured any of this. I was never even allowed to be a Boy Scout. So, as an adult, I’ve tried to play catch up. I started hunting for a number of reasons but probably my main reason for starting was the I liked the idea of being self sufficient and providing my own meat. There is a primal pride that comes with knowing that you supplied the meat you are eating through your own time and toil. There is a metaphysical difference to me between eating meat that I stalked and hunted and put on the table through my physical effort versus meat that I purchased from a faceless supply chain with money I earned sitting at a desk. Why do you continue to hunt? Aside from the reason I started, I continue to hunt for a number of reasons. I hunt because I believe in facing the truth of where our food comes from. This is kind of a big one as we are largely removed in modern society from the origins of our food. We see those sanitized packages of meat in the store and can, through looks, environment, and even calling it by a different name, ie. “meat”, remove ourselves from the reality of the situation, namely that we are consuming the muscle tissue of a dead animal. I think that, if a person can’t be OK with the reality of what they are consuming, then they should reexamine eating meat. Hunting gets you as close to the truth as you can get. You see that animal walking through the woods, living the most natural life it can live. You are there the moment its life is ended. You do the dirty work yourself of butchering or, depending on your situation, at least field dressing. There is blood and gore but there is also the cycle of life and a greater sense of gravity and thanks for the life that has been taken so that yours may continue. I’m a big believer in the whole idea of, with very few exceptions, eating what you kill. Life should not be taken lightly. All care should be given to be as humane as possible. Conservation is another important reason I hunt. As humans have spread, there are far less natural predators for deer. Most people consider there being less wolves, coyotes, etc a good thing, as those species cause a more immediate threat to humans. However, in the absence of hunting, deer populations explode, spreading disease, causing agricultural damage (one farmer I know calls them Whitetailed Field Rats), and crowding out other species, not to mention that overpopulation leads to a scarcity of resources for all deer leading to slow death from starvation and eventually population collapse. Deer breed fairly rapidly. A sexually mature doe who is impregnated during the rut will give birth to one to three fawns come spring. Hunters help control the population so those animals that aren’t culled from the herd can be stronger and healthier and ensure a continued balanced population. Through maintaining wilderness habitat for wildlife, practicing ideals such as quality deer management (which seeks to ensure a healthy and balanced deer herd), and helping control the population, hunters ensure that we will have these natural resources to enjoy for years to come. A prime example of what can happen without hunters helping maintain the balance is that of the UK. This article from last year shows the dire situation they are in from a lack of hunting or predation of their deer. Yet another reason to hunt is to enjoy the peacefulness and serenity of nature. It is calming to be out in the woods, away from the noise of society, listening to the sounds of nature and simply being present without distractions. It’s a hard feeling to describe for someone who hasn’t experienced it but the best way I can put it is to almost call it an awakening of the senses. You become aware of every small sound, every little bit of movement, every smell. It makes you realize how much you miss out on in the modern world. Finally, you can’t get around the fact that wild game is simply delicious. There is nothing like a nice medium rare venison steak or some braised bear. Wild game has a complex flavor that far surpasses their farm raised cousins. Principally, I hunt deer, more than anything for the fact that it provides the biggest amount of meat to effort ration for commonly available game. I’ve also been known to hunt squirrel, rabbit, bear and turkey. If anyone wants to take me elk hunting, I wouldn’t say no either. How do you respond to people who feel that hunting is barbaric? There are really three types of people who are anti-hunting (as opposed to just uninterested in doing it). I will offer my personal rebuttal to each. The first type is meat eaters who somehow have this romanticized Disney lie in their heads about going out and killing cute little Bambi or Thumper. For a lot of these folks, you have the whole issue of “X animal is too cute to kill.” This group is probably the most hypocritical because they will tell you that hunting is mean and evil while eating a hamburger made from a cow that came from a CAFO, was force fed corn, antibiotics and antacids, and then brutally put down. To these folks, I would ask them which is truly more humane, their CAFO meat or an animal that was able to live according to its natural instincts up to the last few moments of its life? The second type are those who insist on pushing their values on others. I make this qualification because I know plenty of vegetarians who, through examination of their own conscience, won’t eat meat but don’t judge those who do. To me, the simple fact is that humans are omnivores. We evolved to eat meat as well as vegetables. Recent scientific studies even suggest that it was the ability to cook and eat meat that gave Man an evolutionary advantage and allowed us to develop bigger brains. These folks are often also hypocritical because they never think of the insects killed by the pesticides sprayed on their vegetables, the small field mammals caught up in threshers and harvesters, or the aforementioned affects of overpopulation being bad for entire populations of species. From my religious standpoint, mankind has been given dominion over the animals and while we have the duty to be responsible stewards and humane, we also have the right to use them for food. The last type is that of people who have this idea of the hunter going into the woods, bristling with weaponry and technology, and gunning deer down left and right. These people have some “fair fight” idea in their heads that makes them think that hunting is like shooting fish in a barrel and all too easy. While such opportunities exist and can only loosely be really called hunting in my opinion, for the vast majority of hunters, you are pitting your gun/bow/etc against millennia of evolution of prey species that have adapted quite well to not getting caught. Turkeys will see you and be gone LONG before you ever see them. Deer have insanely good senses of sight, smell and hearing. Anyone who thinks hunting is easy is welcome to join me and find out what it’s really like. It makes me think of the joke “Chuck Norris doesn’t go hunting because hunting implies the possibility of failure. Chuck Norris goes killing.” For those of us who aren’t Chuck Norris, you fail FAR more often than you succeed. To all these groups, I would suggest that, instead of taking someone else’s word for it, get to know a hunter, talk to him or her about why they do what they do. You’ll find that the vast majority of us are incredibly respectful and in awe of the animals we hunt and grateful for the bounty they provide. I, for example, say a prayer of thanksgiving over the body of any animal I kill. This is a practice that you will find across many centuries, cultures and faiths. Do you hunt for trophy or for food? How much food does a deer produce? I am primarily a food hunter. I don’t begrudge people who hunt for trophies as long as they make sure that the meat from the animals they kill is still put to use, whether by them or via donation. PA, for example, has a program called Hunters Sharing the Harvest where a hunter can take his/her deer to certain processors who will process it for free and donate the meat to the local food bank. When a person goes on safari, that meat is often donated to local villages. A deer will produce about 60% of its body weight in edible meat. If you think about it, it’s a tremendous value and the ultimate locavore sourcing of your meat. Farm raised venison goes for about $20/lb around here. Even with paying a processor, I can get my venison for the cost of about $1/lb and the cost of a bullet and some time in the woods. The initial costs associated with hunting are rapidly recouped with the first couple of deer. What are the ethical considerations that you take into account when hunting? I’d say your two primary rules are that you eat what you kill and that you only take clean, humane shots. From a practical standpoint, your meat will taste better the less that the animal runs/suffers. If you get off a bad shot, just like with any other mammal, adrenaline will dump into the blood and can affect taste if you have to track the deer for a long time. Also, you never want to leave a wounded animal out there if you can help it. It’s cruel and a bad shot consigns that animal to starvation, predation or some other unhappy demise. I would add onto this that there are hunters who act like getting that kill is akin to scoring a touchdown and will do their victory dances and other stupid rituals. They are a small minority, but make us all look bad. Life should never be taken easily and one should treat the situation with the gravity it deserves. From the impact of hunting? I would say no, not these days. Back in pioneer days where you could just shoot anything that moved, hunting could definitely have a negative impact. Don’t believe me? Ask a buffalo. These days, state Game Commissions work hard to set appropriate laws, seasons and bag limits to ensure that hunters have access to the bounty of the forests but also that future generations will have the same opportunities. As I said before, hunters are the original conservationists.Anything else you want to add? It can be daunting to get started in hunting but it is a rewarding pursuit, literally and figuratively. If you have questions for Mark, feel free to leave them in the comments. Somehow a lot of the items feel like fall, but it most definitely feels like winter out there. Let’s start with the beets. You know those will go to a beet-friendly home or the beet-friendly compost pile. 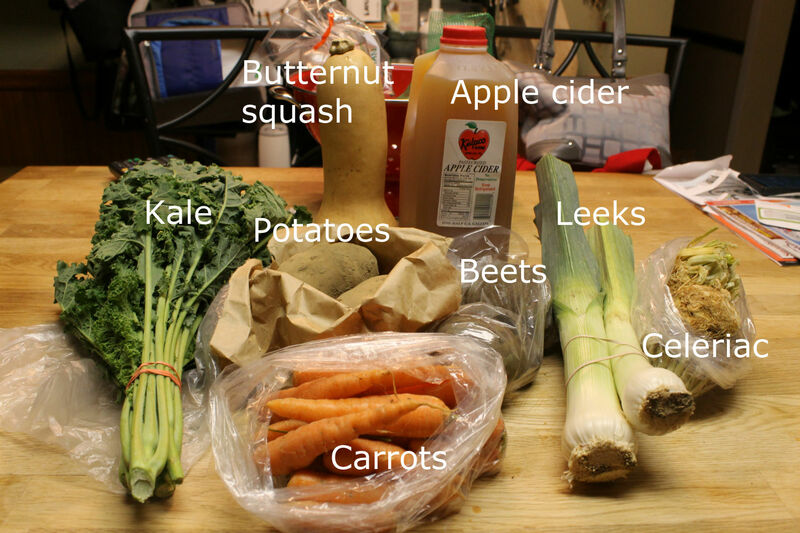 Carrots will get used up in all the regular ways – salads, mirepoix base, etc. 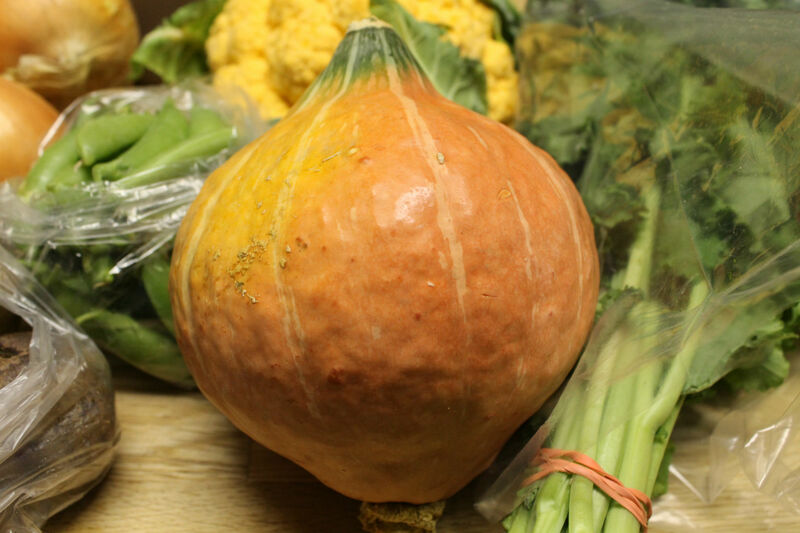 I have another butternut squash in the root cellar, so I think I’ll combine the two and make some winter squash chowder with a recipe from one of my America’s Test Kitchen Light & Healthy Cookbooks. I love those cookbooks because they have lighter food without using stupid diet ingredients or such disgusting abominations as fat free cheese. Isn’t kale a cool looking vegetable up close? I have taken to just throwing kale into any dish I’m making that would be fine with added greens. The lasagna soup with kale added in was a delicious success. 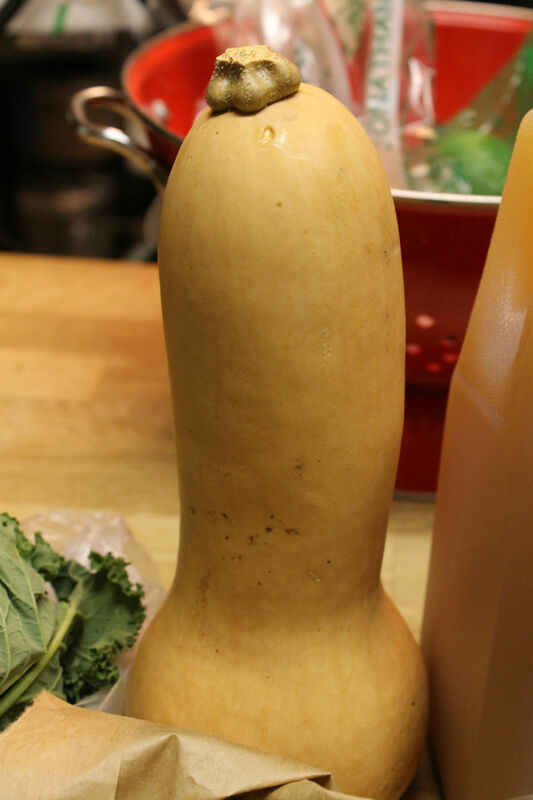 Whatever’s not used in the winter squash chowder will hang out for the next dish that could use some wilted greens. I’m thinking that we should use these leeks on a pizza, maybe with mushrooms. I love potato leek soup, but I don’t want that to be the only dish we make with leeks. Last but not least, we have mandrakes. I mean, celeriac. This time, the greens didn’t come with them, which was actually helpful since I have zero room in my fridge right now for the space the greens take up. These will likely get roasted up with some other root vegetables. After I shave them, that is. 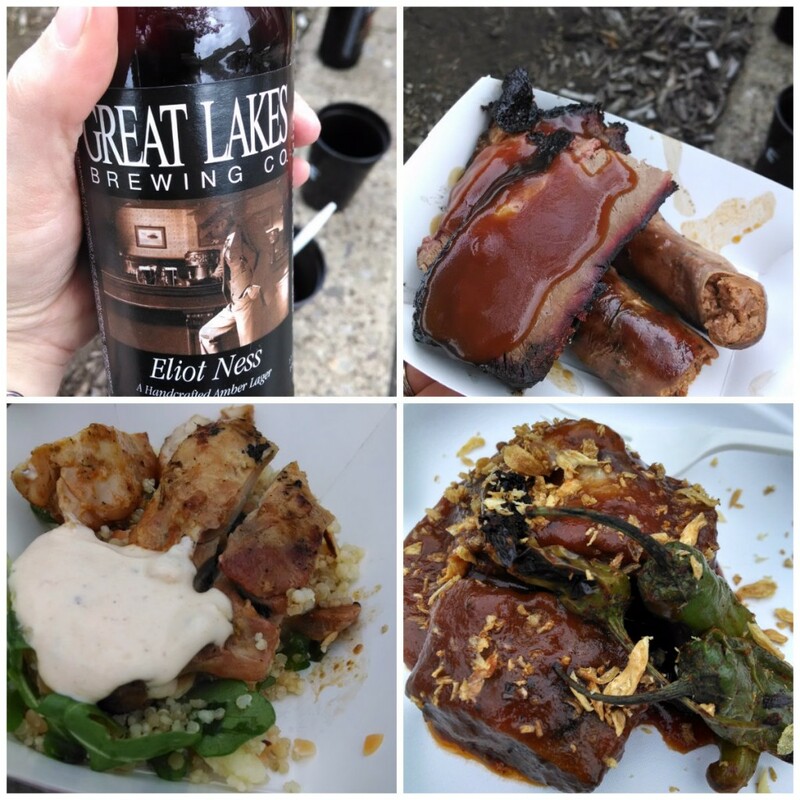 This weekend, we were lucky enough to be guests* of Penn’s Corner Farm Alliance at an event on the North Side called Back of the House BBQ, sponsored by Table Magazine, benefiting Youth Places and their job training programs in the culinary industry. Penn’s Corner sponsored the Pork Team and the chefs cooked with some of Penn’s Corner’s offerings. Let me tell you. 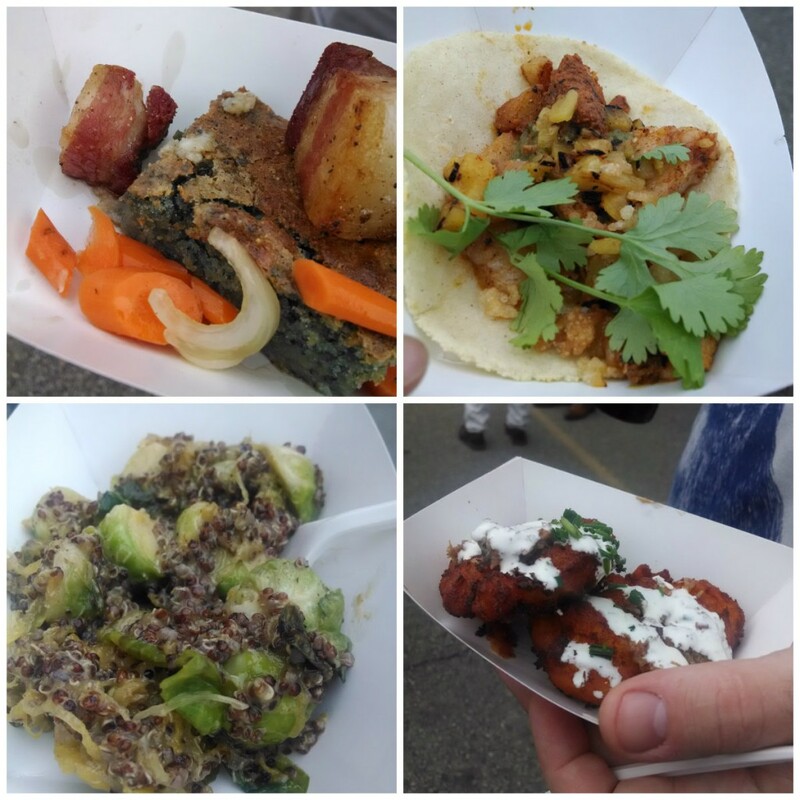 I’ve been to several different food tasting events in the city, and this one was hands down the best. I mean, spectacular. The basic set up was that chefs from the best restaurants in the city cooked a piece of a BBQ dinner – they had beef, pork and chicken, plus starches and veggies. Your tickets gave you seven tickets to take to seven of the stations to taste, with the option to purchase more. We usually like to go whole hog at these things (no pun intended), but the portions were so generous that we were full with our tickets! The atmosphere was really great too – you could tell people were really enjoying the food and the music was good. It wasn’t an awkward, stand around and look at each other, pick at a cheese plate fundraiser. I would definitely check out other events put on by Table in the future. In any case, this is the important part. The food. The photos don’t do the food justice – but I was juggling my phone, drink and delicious food, so this is the best I could do. Smoked Brisket with Coffee BBQ sauce by Chef Rick DeShantz of Meat & Potatoes and Butcher & the Rye and Handmade Chorizo by Chef Keith Fuller of Root 174. The Coffee BBQ sauce was nuanced and didn’t hit you in the face, but it was so delicious on top of that brisket. The chorizo was really flavorful and packed some heat – the best kind that isn’t just spicy, but warms your mouth with every bite. Beef Short Ribs (I believe, with shoshito peppers) by Chef Sam DiBattista of Vivo Kitchen. Meat fell off the bones – and again, with a delicious sauce. I know I shouldn’t be surprised that we had good sauce at a BBQ event, but still. Jerk Chicken Thighs over a quinoa with almonds and a yogurt sauce by Chef Brian Pekarick of Spoon, BRGR, Grit & Grace and Willow. I was expecting chicken to be the bland dish, next to all of the beef and pork. But this was not at all bland – and Mark even remarked that it was the first preparation of quinoa he’s ever really enjoyed. It was cooked perfectly and the yogurt sauce was a great complement to the jerk seasoning on the chicken. Pork Confit with Blue Cornbread, Cracklings and Pickles from Chef Bill Fuller and Eli Wahl, of Big Burrito Restaurant Group (home of Next Gen House favorites Eleven, Soba, Kaya and Casbah). The cornbread was really tasty and moist, especially with some fat leeched in from the pork confit. Pork Belly Pastor with Charred Pineapple and Togarashi from Chef Derek Burnell of Round Corner Cantina, Chef Roger Li of Tamari and Chef Domenic Branduzzi of Piccolo Forno. While the pork was great as expected, the homemade tortilla and charred pineapple really made this dish. Brussels Sprouts Salad with Red Quinoa. I believe this one was from Chef Stephen Thompson from Bluebird Kitchen, though I’m not positive on that one. The sprouts were crisp and the red quinoa was really good – the second delicious quinoa at the event (we’re converts!). The citrus flavors were delicious. Sweet Potato Fritters with Bacon Glaze from Chef Ryan Chavara of Whole Foods Pittsburgh. I was expecting these to be tasty, but they were out of this world. Crispy on the outside, hot and soft on the inside. And that bacon glaze with the buttermilk sauce? It would be amazing if they served these in their hot bar at the store! 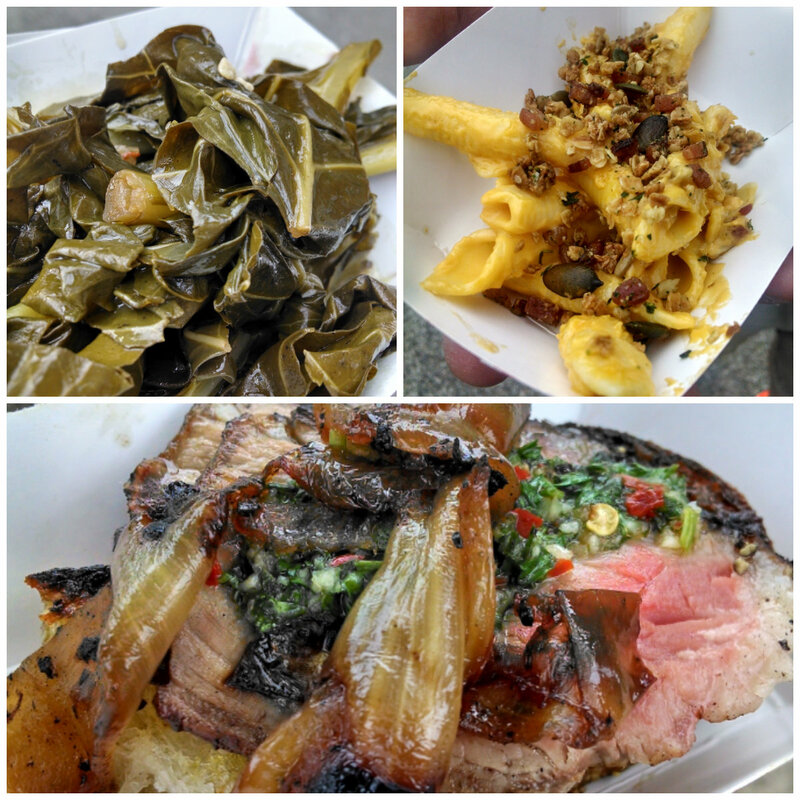 Collard Greens from Chef Kate Romane of E2. Mark laughed because he knew I’d be all over the greens like a rat on a Cheeto, seeing that I am over the moon about chard and collards and spinach, etc. These had such a deep flavor and a seasoning that really made them taste hearty and green (if that makes any sense). So simple and so delicious. Butternut Squash Mac and Cheese with a savory granola from Chef Jason Dalling of Habitat. (This one was in the same area as the brussels sprouts, so I might have messed this one up too.) Regardless, it was amazing how this still tasted like mac and cheese, even with the addition of squash. Usually butternut squash pasta just tastes like butternut squash, but this was great – really a “gourmet” mac and cheese. And savory granola? Who knew? NY Strip Steak with Chimichurri and carmelized onions on toast from Chef Anthony Falcon of Gaucho. I saved this one for last, because I admit: I used two tickets so I could have a second serving. I love chimichurri but don’t make it or eat it often. It’s probably not classy to say, but every bite of this made me make a noise – like “ugh, Mark, this is so amazing” or “aahhhh, so good” or just a groan with my eyes rolling up in my head. I need to get myself to Gaucho for dinner, pronto. We are so lucky in Pittsburgh to have the kind of culinary scene that we do – restaurants with insanely talented chefs (who are generous enough to donate their time and skills), supplied by amazing farms and cooperatives who grow the ingredients that make a food scene possible in the first place. Thanks again to Penn’s Corner for letting us be their guests and to Table and Youth Places for putting together such a great event! *We attended the event as guests of Penn’s Corner, but I was not asked to write about it or advertise them in any way. My words are entirely my own. I just can’t stop thinking about the food, so I had to share it. We’re solidly into October with the share this week – with the heavy hitters of fall. 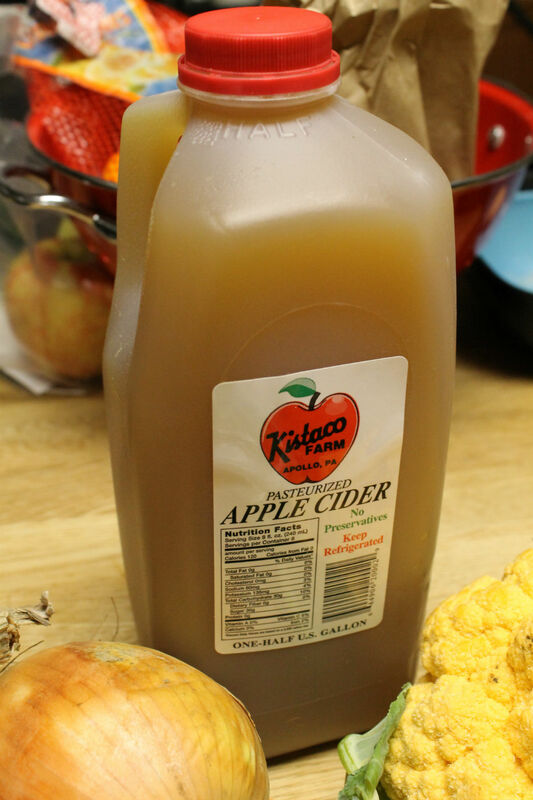 Apple cider and squash in the same share? Yes, please. I love seeing onions and garlic, too, because even though they are year-round staples for us, I think the local stuff just tastes so hearty and flavorful. I swear I taste a difference in local onions. Not that I’m eating a ton of them raw, but they even smell better. 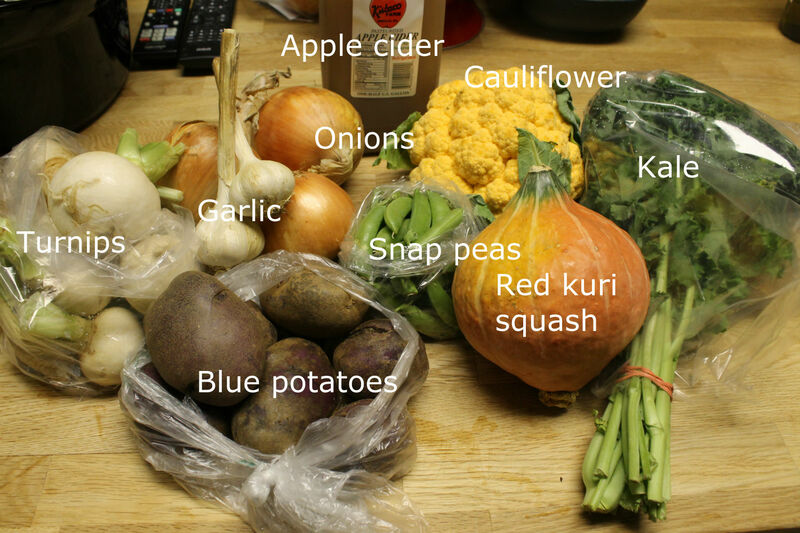 Ah, kuri squash. Until I had delicata squash a few weeks ago, these babies were my favorite fall squash. All I usually hear about are acorn, butternut and spaghetti squash – but these are just so delicious roasted and mashed. Going to see if kuri squash can still hold its own against delicata. It’s like squash wars in our house or something. 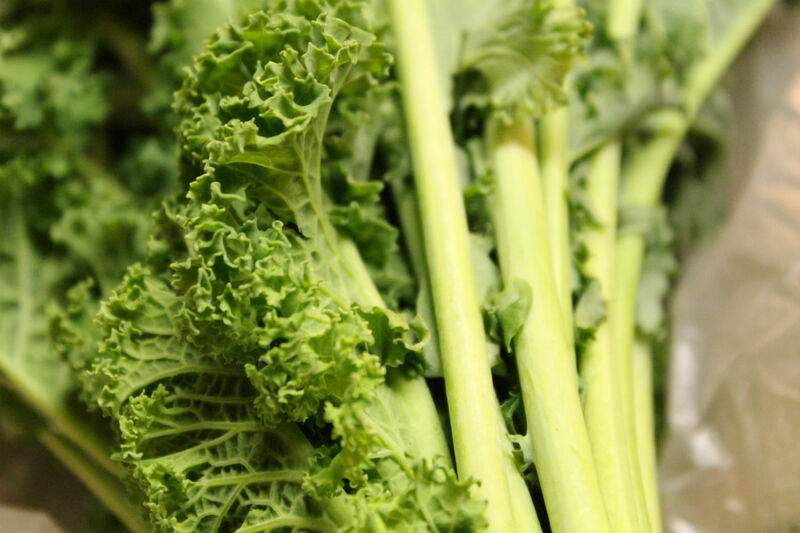 Kale will likely go in a stew or soup of some kind. For me, kale is best served really warm and soft, with a lot of the bitterness leeched out. Perhaps I’ll follow up on last week’s kale idea and make lasagna soup with the addition of kale. That or a potato soup with kale. 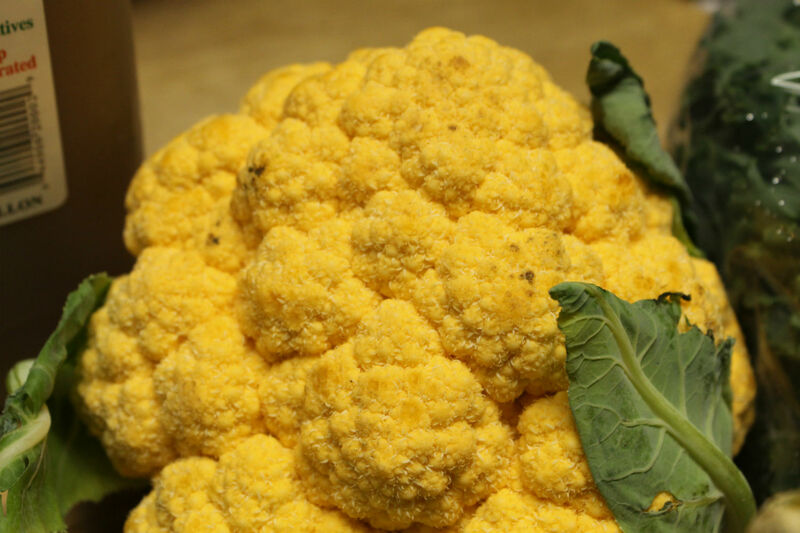 I confess I was excited when my box had cauliflower instead of broccoli, because I LOVE roasted or mashed cauliflower. 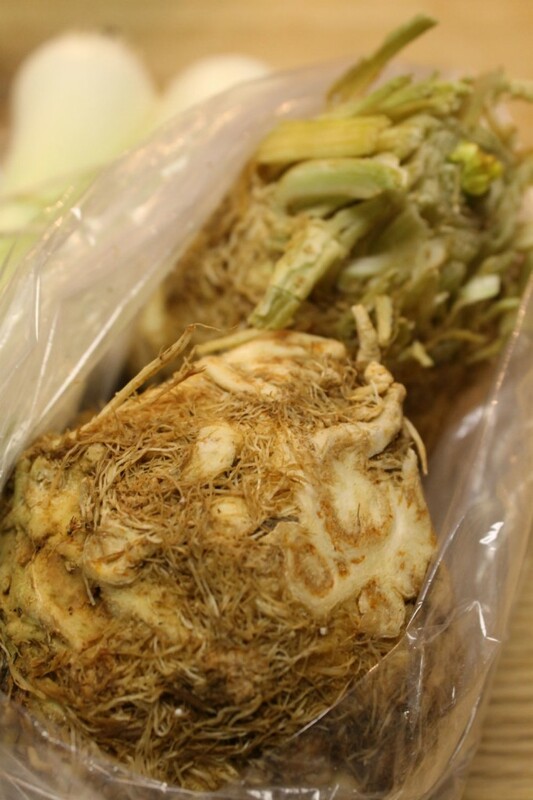 We’ll probably eat it as a side dish prepared one of those ways. And look at its awesome color – it practically vibrates! The turnips will also probably get roasted, too. Whole lot of roasting going on in the fall at Next Gen House, that’s for sure. What vegetable is NOT better roasted, though? 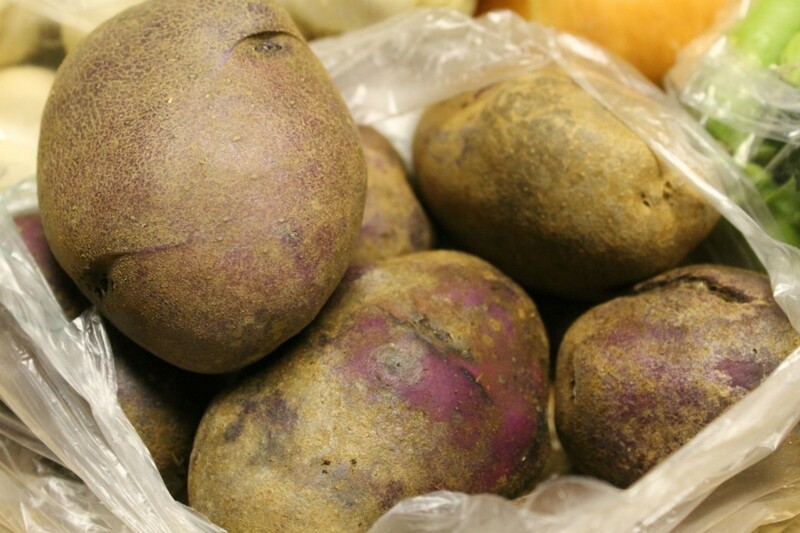 Blue potatoes are just awesome because of their color. I’m sure these ones from Clarion River are also delicious as well, but I just love how they look. Hmm, what should we do with those? ROAST THEM?! Snap peas might go in a stir fry – I have been craving Mark’s homemade cashew chicken or teryaki anyway. If not, we could just eat them like a snack. I haven’t eaten much in the way of fresh peas this year, so this is a fun surprise. Speaking of fun, we’ve come to this. The first apple cider of the year. Last year we had to freeze some to keep up with it, but I’m going to give it my best effort this year to keep up. I often use cider to make my homemade granola when it’s available. But for this particular jug? Let’s be honest. Going to probably warm it up and spike it. Wouldn’t you? “Time flies” is an overused expression, but I can’t believe it’s now October. (My favorite month!) Time for one last quarterly check-in on my goals for 2014. You can find the others here: January, April and July. Yesterday I finished book #70, so this goal will definitely happen. I also just started one of Margaret Atwood’s books because I’m scrambling to meet the sub-goals of finishing the last 6 books I haven’t read in Atwood’s canon, as well as that one Russian door-stopper. I’m at least aiming for the Atwood goal, even if I have to carry over the Russian one for 2015. Audiobooks are a huge part of my reading life in a way they never were until about 18 months ago when I started listening to them on my commute. Now I twitch if I have a gap in books due to library holds. But reading still remains my longest hobby and joy, dating back to 1986 when I begged my mom to teach me how to read when I was 3. I therefore had no doubt I’d nail this goal. Write letters on three issues to my elected representatives. I wrote one in April on the DARK Act, but I’ve been slacking on this front. Need to get on that. Less than 3 weeks to go until I can check this one off. I’ve been training for 20+ weeks and I’ve run over 500 miles so far. This will definitely be the 2014 resolution that was the biggest challenge. I’ve done pretty well with this during marathon training, but I know that I could do better, more consistently. I need to make sure to keep it up even when I’m not running a gazillion miles at a time. Start my home brew kombucha. Done and done. I need to restart more brewing since I made vinegar, but I’m waiting until after the marathon so I can keep closer tabs on it. It’s been one of my favorite things I’ve done this year – though like many other things in my life, it got overshadowed by marathon training. We made one new variant of jam this year, but mostly we canned the usual. But ironically, we froze a bunch of new stuff that we’d never preserved that way before – including lot of tomatoes, chard and roasted peppers. Plant a bee-friendly flower garden. My flowers recently kicked the bucket, but they were nice while they lasted. And I did spot some bees this summer, so that’s more than previous years! Make the chickens some treats. We’re down to two, so I have no excuses to not make them some treats this fall. How are you doing on your goals for 2014? Welcome to Next Gen House’s new home. Thanks for making the move with us. Don’t forget to join Next Gen House on Facebook, Twitter and Instagram. While I’m catching up from a busy weekend, check out these stories I’m reading this week. Incredibly interesting piece on the food stamp recipients that we never talk about – the stores who accept them. Often the store’s own workers are recipients and then go on to purchase food from the store, giving the store an extra profit on top of the benefit of paying them a low wage to begin with. This is something that’s very rarely talked about in the media; they’re often too busy vilifying the recipients for fraud to even consider that the companies who receive the funds might be committing fraud as well. The FDA has known for many years that many drugs given to animals that we eat are a risk to human health – a “high” risk. When will we start to really take antibiotic resistance seriously? And why does it take a Freedom of Information Act request to reveal that our government agencies don’t take public health and safety seriously? Yet more evidence that antibiotic resistance needs to be taken seriously, and we need to take steps to reduce our intake of unnecessary antibiotics. Keep them out of foods and only take them when you need them for infections. This isn’t so much an article as it is a great app if you’re interested in checking out your beauty and cosmetic products to see what’s in them and what might be hazardous or toxic. They’re working on a database and app for food products too.